Do you love the car you drive? If you're like the millennial women we recently surveyed, the answer is a resounding "yes." As part of our 2017 POPSUGAR Insights Auto Report, we surveyed over 1,200 US millennial female in-market auto shoppers to better understand their perspective on shopping for their next vehicle. We asked this audience of car shoppers about which vehicles they currently own and how satisfied they are with their current vehicle make and model. Over 3 in 4 millennial women we surveyed currently own or lease a vehicle. The most popular three owned brands are Toyota, Chevrolet, and Honda. After those top three brands, other popular owned brands include Hyundai, Jeep, Nissan, Mazda, and Subaru. Overall, millennial women are extremely satisfied with the current make and model they own. 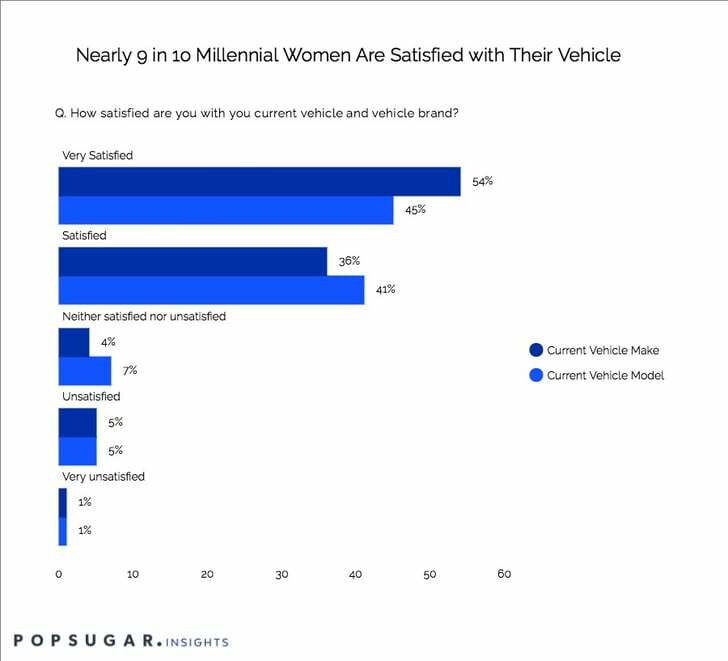 Eighty-seven percent of millennial female vehicle owners are satisfied or very satisfied with their current vehicle make, and 83% of millennial women are satisfied or very satisfied with the current model they own. Millennial women are 19% more likely to feel very satisfied with their make than their model, while they are 14% more likely to feel satisfied with their model than with their make. This is very good news for auto manufacturers looking to build a lifetime brand relationship with millennial women who have had positive experiences with their current vehicle makes and models.